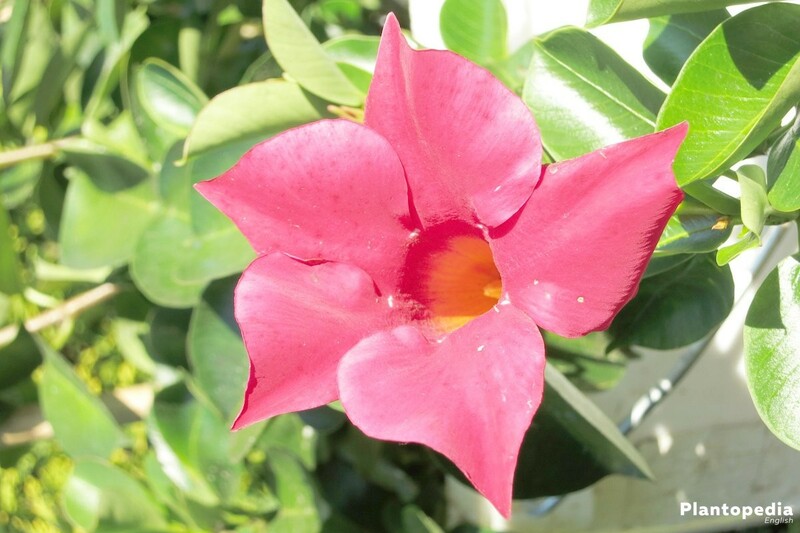 Mandevilla was originally a lianaceous plant and is cultivated today as a hanging climbing plant or semi-creeper. This exotic-looking nonstop bloomer is frost-sensitive and therefore is predominantly kept as indoor plant. These plants are amazing blossoms. 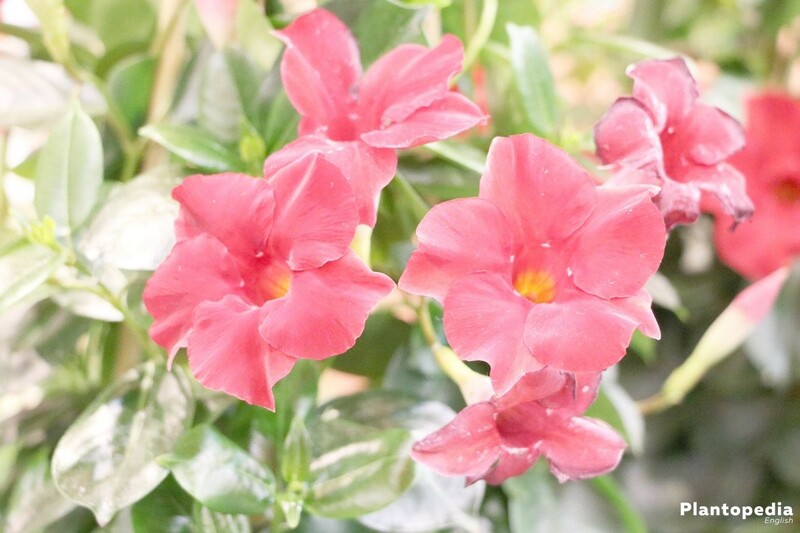 Their bright flowers shine in different colors and shades and form a conspicuous contrast to the green foliage. Plant lovers also appreciate the uncomplicated care of this extraordinary plant. Typical for the more than one hundred species of Mandevilla is its hanging growth, some varieties are also growing upright or lying down. 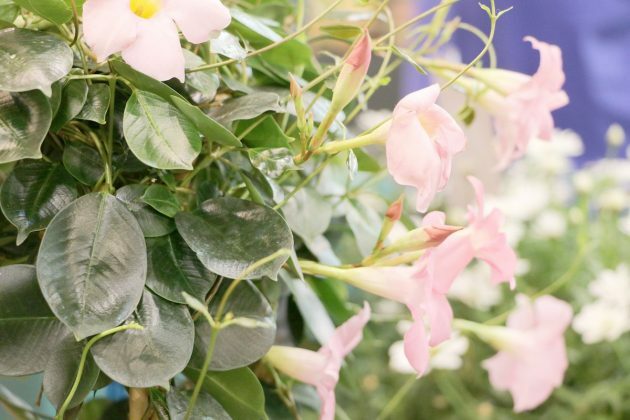 Their vines can reach a length or height of up to 5 m. In addition to the green foliage, the highest ornamental value is the large funnel-shaped flowers. During the flowering period they show enormous persistence. 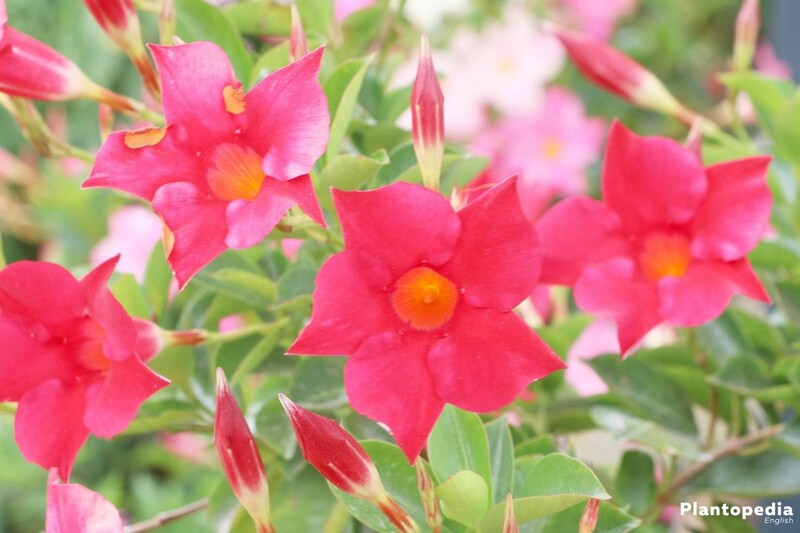 From May to October the white, pink or red flowers reveal their whole splendor. The potted plant is ideal for decorating living rooms, but also balconies and terraces. Even if this nonstop bloomer is not quite easy to care for, its blooming splendor compensates for so much trouble. 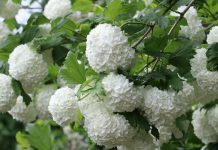 Although it does not impose any great demands, the right location and the optimal care prerequisite for a prosperous flowering. But you should consider some basic things. The site should be as warm as possible, sunny and protected from rain and wind. A good ventilation is also important, so that the air around the plant does not accumulate. This applies to a cultivation on the balcony as well as in the apartment. Avoid direct sunlight in the summer and, if necessary, shade the site. Sun in the morning, in the afternoon and in the evening encourages the flowering. In the apartment a place protected from draft and in front of a window facing east or west is recommended. Normal residential temperatures are sufficient during the main growth phase. 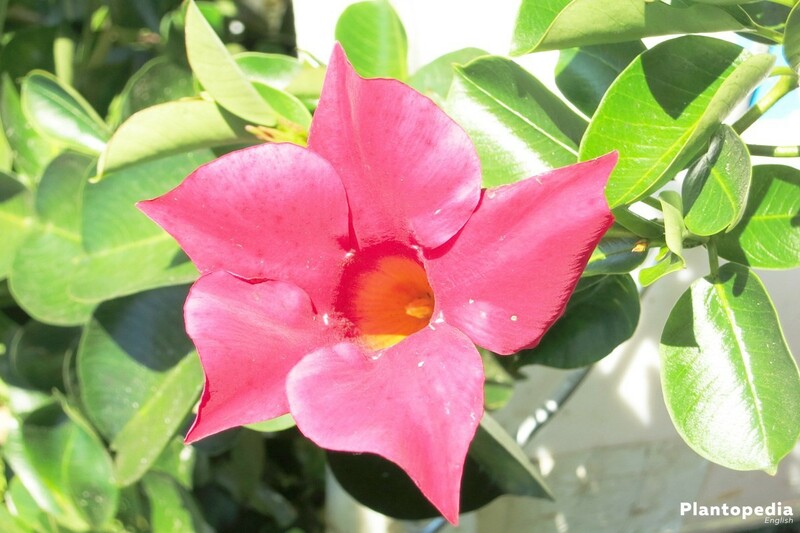 Mandevilla needs fresh, permeable and nutritious substrate. It should be loose and humus. 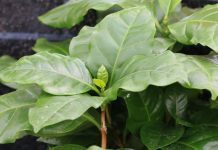 This can be conventional soil for balcony plants or a commercially available compost-based potting soil, which is mixed with sand or fine gravel. Particularly good is a mixture of peat gull, clay, some coarse sand and leaf mould. The substrate may be neutral, slightly acidic or slightly calcareous, with a pH of between 6.0 and 6.5. 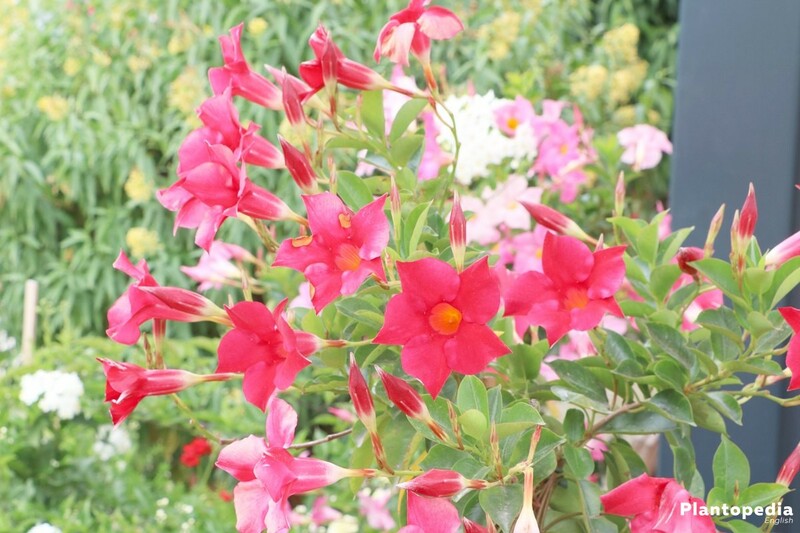 A planting in the garden bed is not recommended, because Mandevilla is not resistant to wintry cold. 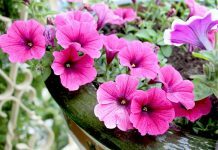 A planting in bucket or balcony boxes is more sensible and usually customary. 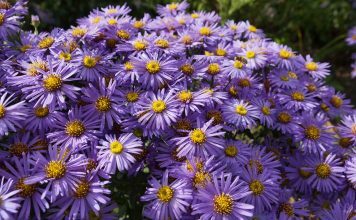 In the summer, however, it can be kept outdoors, where it can remain during autumn as long as it is free of frost. 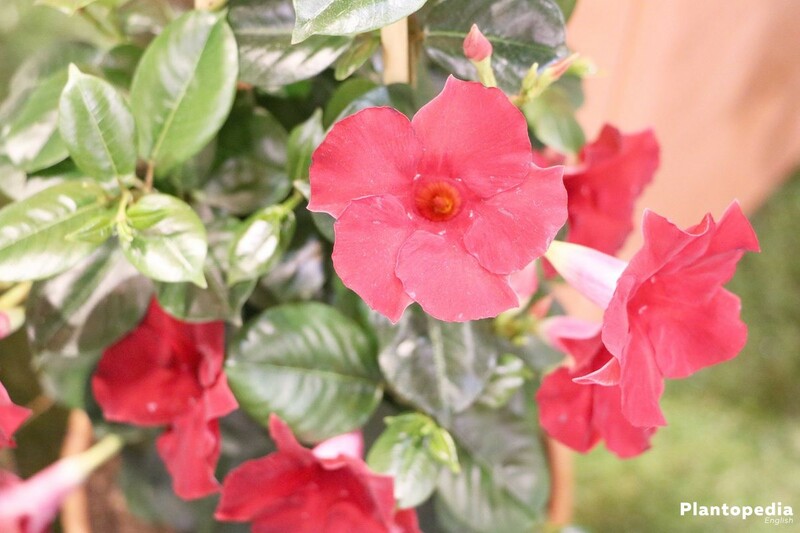 When selecting the planter, it should be noted that this plant grows relatively fast and forms long tendrils. 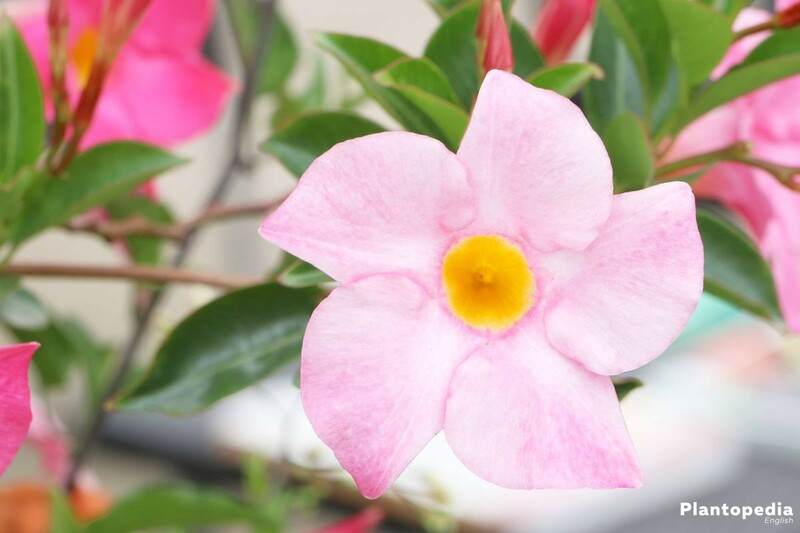 If the pot or bucket is strongly rooted, Mandevilla should be replanted – typically every two years and ideally in spring. For repotting choose a pot that is just slightly larger than the old one. A bucket which is too large causes the plant to concentrate mainly on the formation of new roots, which has a detrimental effect on flowering. 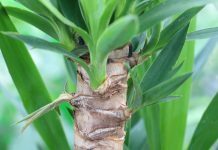 Before the plant is replanted, remove dried, rotten and diseased root or plant parts. In the growth and flowering phase this climbing plant needs sufficient water. 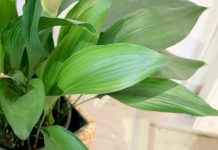 Usually it is watered moderately and not too much. A water supply every 8-10 days is quite sufficient, in summer it should be more frequently. 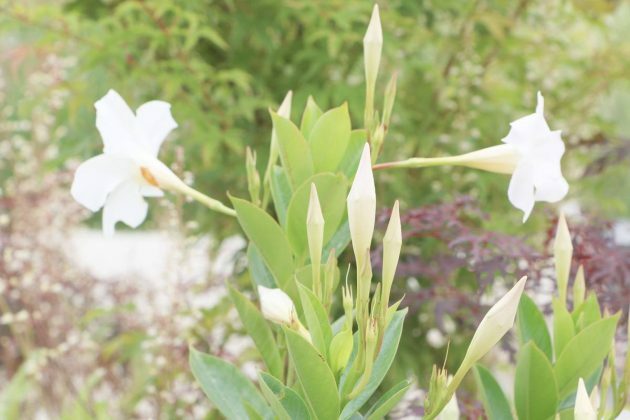 Mandevilla does not like waterlogged soil. As a result, water should be removed regularly. However, the substrate must not dry out. Ideally one should give the substrate layer time to dry before each watering. 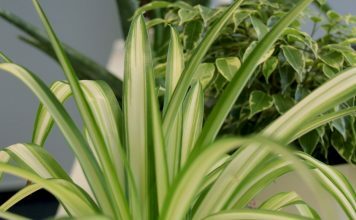 Not less important is a sufficient humidity, which is achieved by frequent spraying. 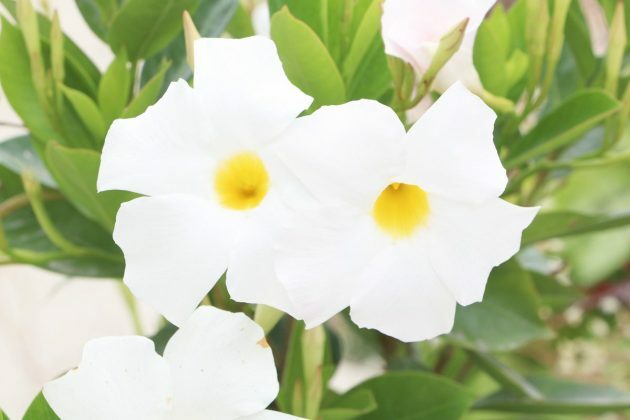 The nutrient requirement of this perennial flower is relatively high, especially during flowering. In order to meet this demand, from April a moderately concentrated, organic liquid fertilizer for flowering plants can be administered every 1-2 weeks via watering. The dosage should be adhered to the manufacturer’s instructions. 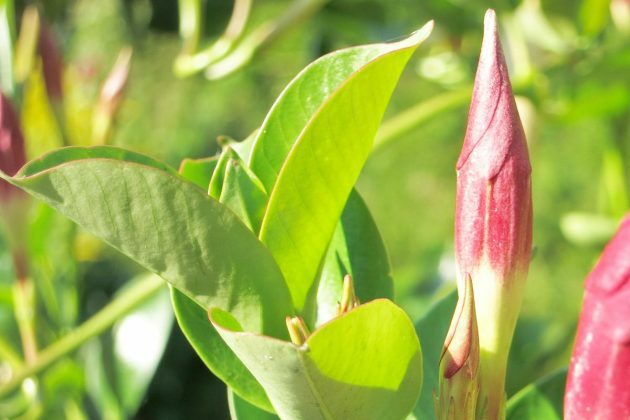 Fertilization should be discontinued from August, because Mandevilla enters a kind of resting phase. 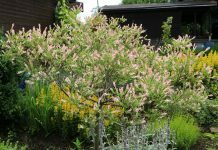 A yearly cut is useful for a strong growth and lush blossom. 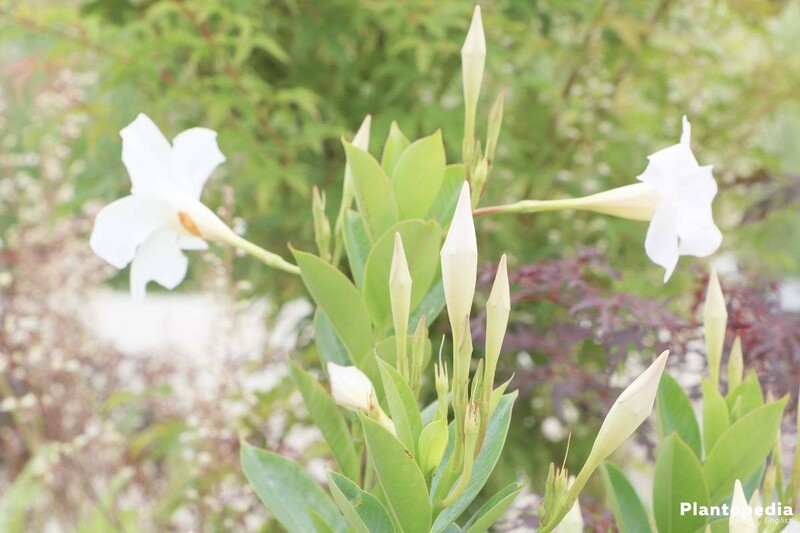 Like most summer blooms, the Mandevilla also blooms at the young shoots, which requires a regular cut. This plant is very cut tolerable, so it is easily viable. If one renounces this, Mandevilla quickly develops a delay in flowering. For the retreat, you should choose a dry day and, what is particularly important, wear gloves. In addition, the garden shears should be as sharp as possible. 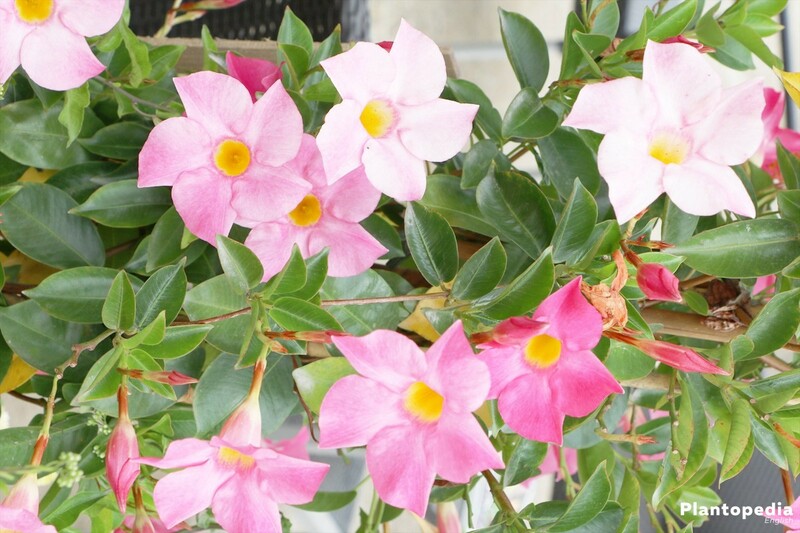 If Mandevilla remains outside during summer, you should bring it into the house till September. Because of its frost sensitivity it should be moved to the winter quarters before the first freezes. 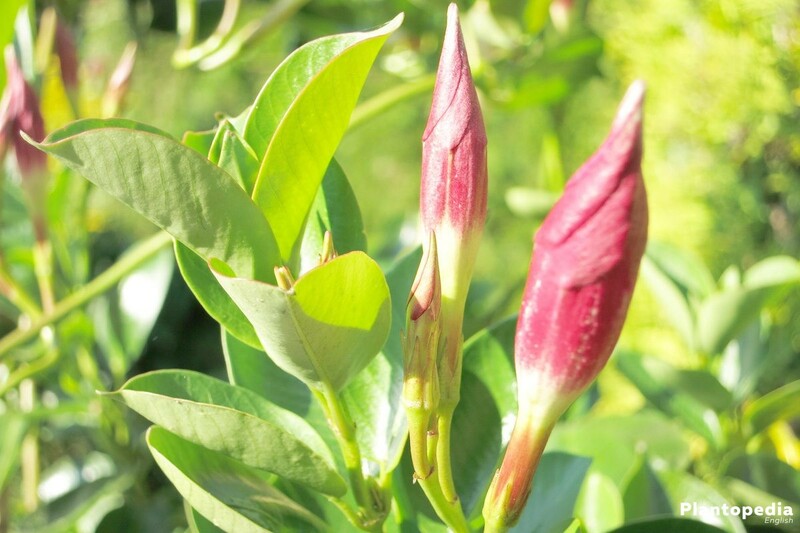 Now, Mandevilla enters a resting phase, which is important. 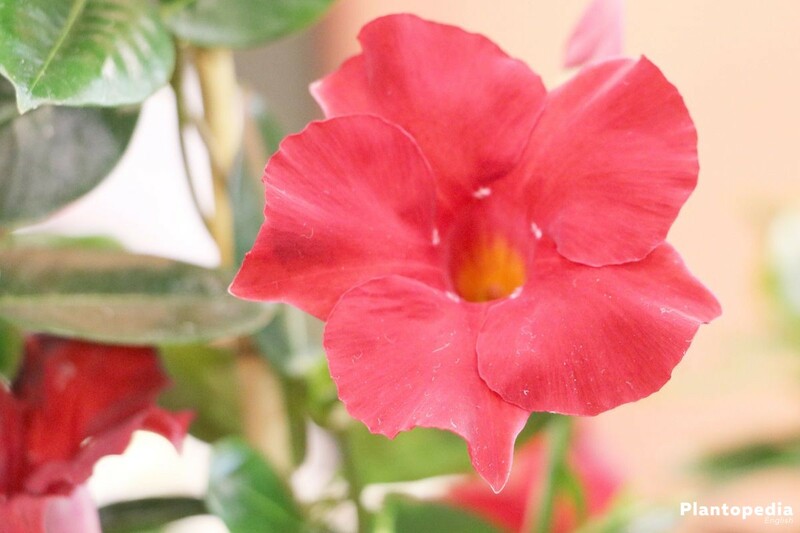 Since the plant belongs to the evergreen plants, the wintering location must be light, free of air draft and at temperatures between 10 and 15 degrees C. It should not be warmer, because otherwise Mandevilla develops a delay of blooming. It should not be too dark, too. Otherwise it will form long, thin gems. 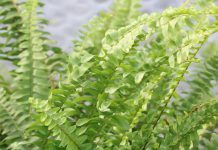 The plants become more susceptible to pest infestation. During the hibernation only a little is poured and not fertilized. From February onwards it can return to a sunny and warmer place. It can be kept outside as soon as night frosts are not to be expected. Before this, a short hardening phase on a shaded area is recommended. 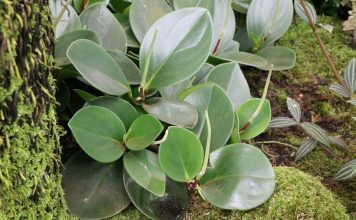 Propagation is possible via cuttings, layers or sowing. 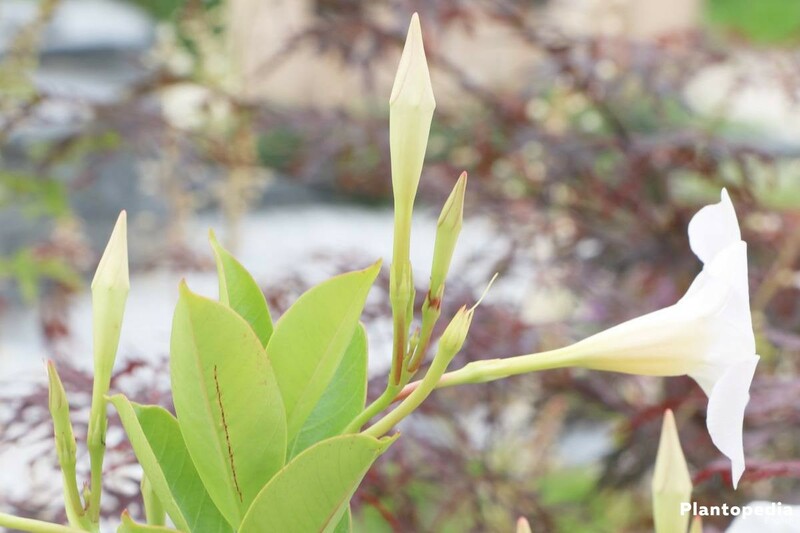 It should be noted that the mother plant is mature and healthy. As a rule, in the case of the annual cutback, there are sufficient shoots which can be used as cuttings. then place the whole pot in a bright place at temperatures of about 25 degrees C.
For layering, a second planter with substrate is required. They are placed side by side. Carefully bend a ground-oriented drive down into the other pot. On a length of approx. 10 cm, the shoot is slightly scribed in the middle and covered with substrate. The tip of the shoot has to protrude out of the ground. With a piece of wire or a not too big stone you can fix it in the ground. Now the earth must be kept evenly moist. If the shoot has formed roots after a few days, it can be separated from the mother plant. In the case of seed propagation, it should be borne in mind that the seeds, that are offered commercially, are mostly derived from hybrids. Consequently, the offspring usually has different properties. The best time for sowing is early spring. The seeds are sown in cultivation soil and easily covered with soil. 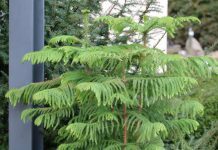 Then moisten the substrate, cover the surface with translucent material and place it on a bright place with temperatures of about 25 degrees C. If the seedlings are large enough, they can be isolated and further cultivated on a bright niche but should not be exposed to full sun. From June, the young plants can be placed outside. If the ventilation is not optimal, a fungus attack may occur. 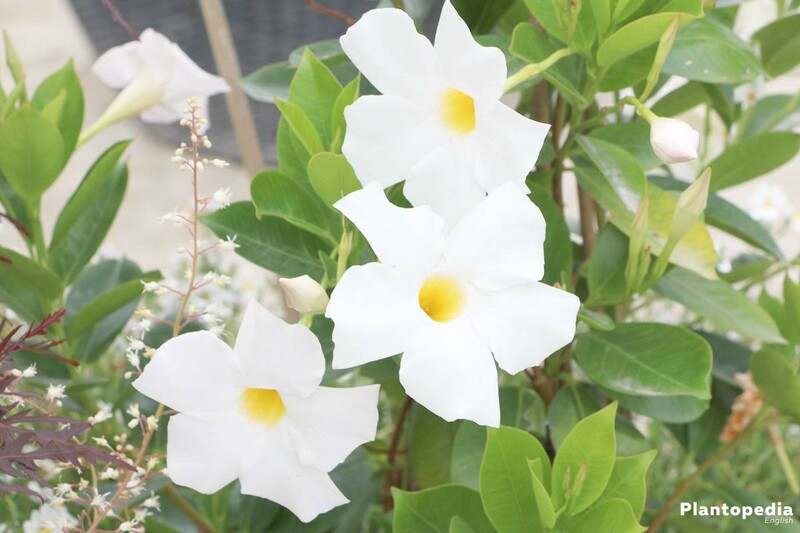 The most dangerous treatment for the Mandevilla is waterlogging, which can lead to the death of the plant over a longer period of time. Occasionally, leaves may turn yellow. In winter, cold temperatures can be responsible for this. 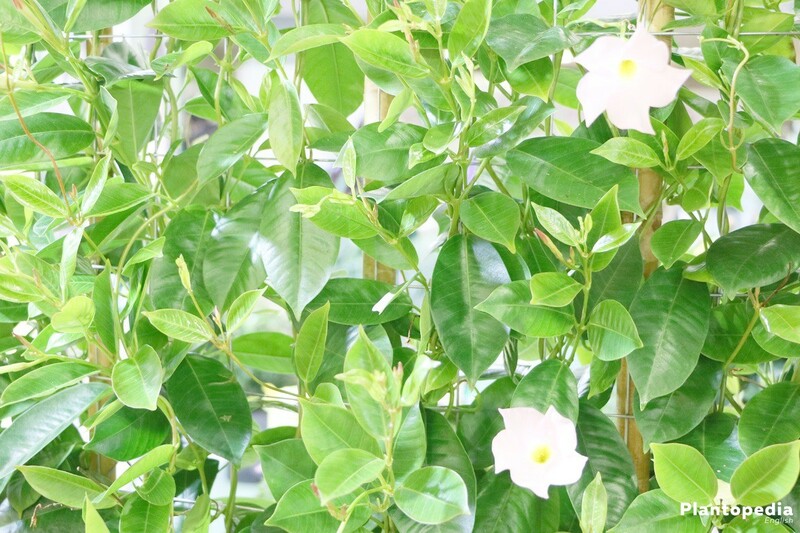 In summer, the yellowing of some leaves is normal and not a disease. Other diseases are not known. Pest infestation or plant diseases usually occur only at unfavorable locations or with faulty maintenance. 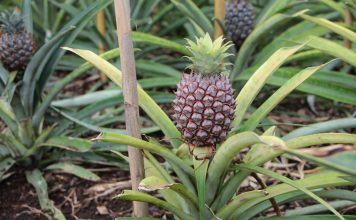 This may lead to an attack with aphids, especially from early summer. 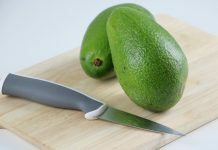 If an infestation is ascertained, it can be removed by spraying with a powerful water jet or by brushing with a soap-alcohol solution. In summer, scale insects and mealybugs appear, if it is not watered over a long period of time. 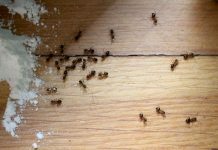 If there is an infestation during winter, it is usually due to a too low humidity. They can be combated by the daily application of a solution of lubricating soap and alcohol or of olive oil. Ichneumon flies also can effectively combat these pests. 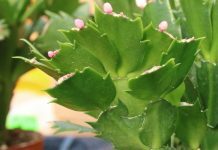 If this is not enough, the specialist dealer offers suitable sprays or plant rods, which are simply put into the soil. Spider mites can be recognized by their fine cocoons, and they like to infect the plants when it is too warm for the latter. 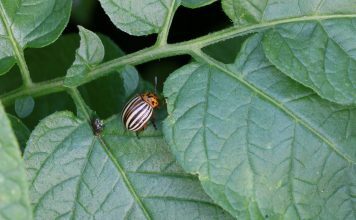 Particularly effective in combating are so-called PP predatory mites (Phytoseiulus persimilis), which one can purchase in an outlet for beneficial insects. 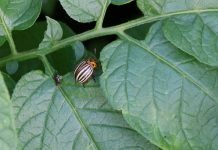 In addition to predatory mites, a soap-alcohol solution can also be used here, as well as appropriate spraying agents from the specialist trade. 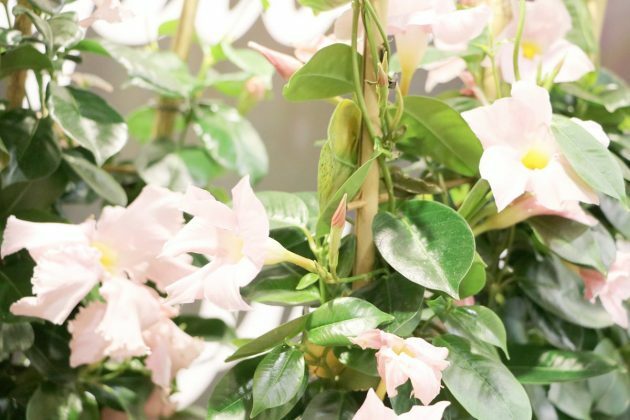 The plant genus Mandevilla includes countless species and hybrids, but only a few of them are cultivated. About 120 species are known worldwide. 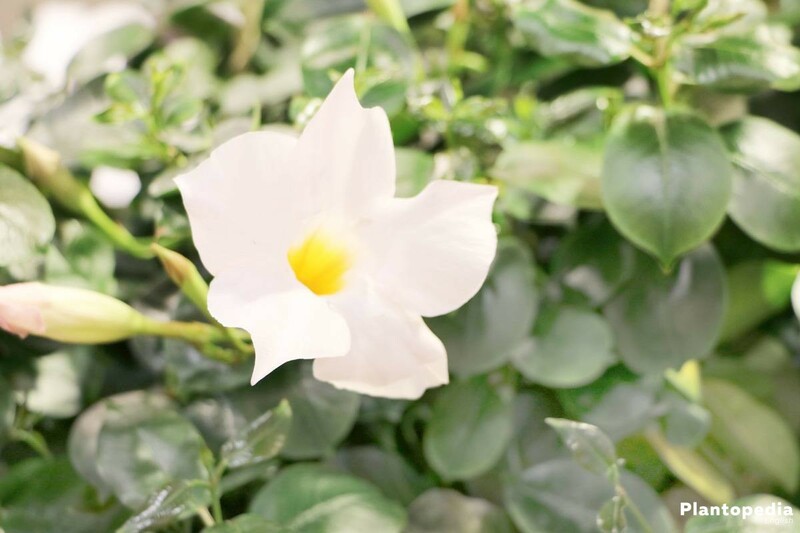 When buying a Mandevilla, you can choose between upright or hanging varieties and different heights. They range between 30 and 500 cm. 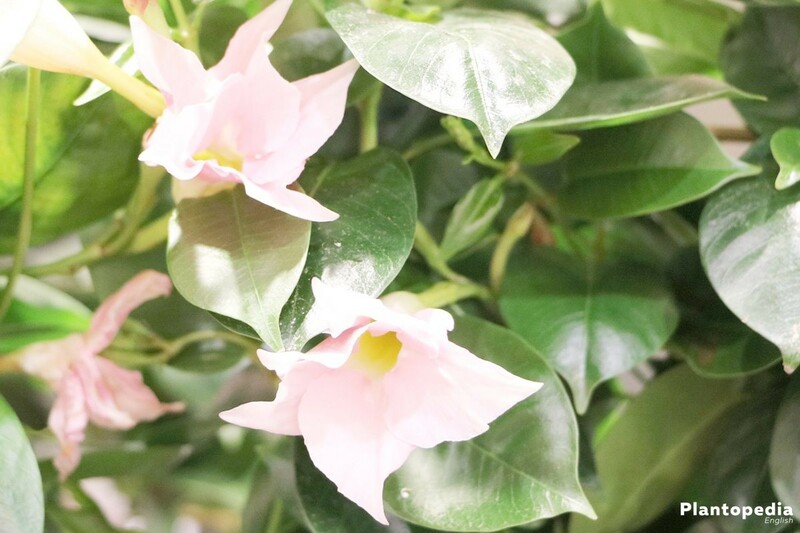 The only feature that all varieties have in common is the shape of the flowers. 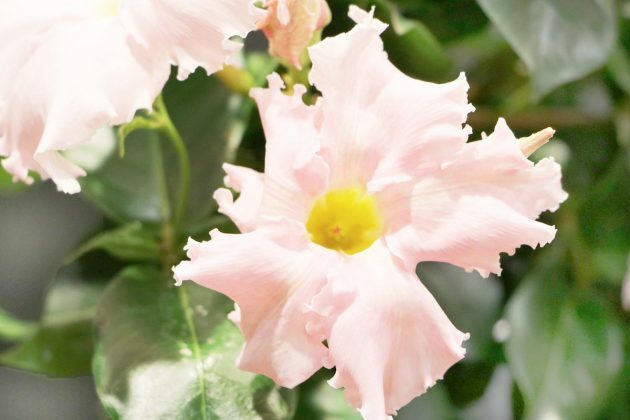 Mandevilla sanderi, Mandevilla boliviensis, Mandevilla x amabilis and Mandevilla laxa are the four species that are most common.